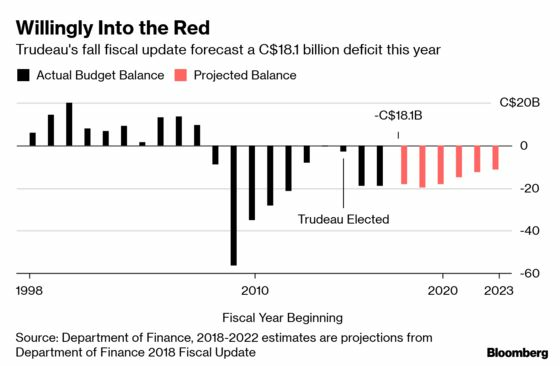 (Bloomberg) -- Canada’s next budget will look very familiar, with Justin Trudeau set to spend much of a revenue windfall and continued red ink in his government’s books. “This is an election budget, it’s safe to say,” Goldy Hyder, president of the Business Council of Canada, said in an interview. The lobby group, which represents chief executives at the country’s top firms, has issued a warning about about fading competitiveness, but Hyder’s expectations are low for any major measures there or on trimming the deficit. “We should have been saving, and paying down debt and deficit, during the good times,” Hyder said. The budget arrives amid a cloudy outlook for the nation’s economy. An oil shock last year stunted economic growth, with Bank of Canada Governor Stephen Poloz seen to be in a holding pattern on any new interest-rate hikes. Before Tuesday’s budget, Morneau’s most recent forecasts projected a deficit of C$18.1 billion ($13.6 billion) in the fiscal year that ends this month, followed by five years of declining deficits totaling C$76.8 billion. The government has room to spend, however, without adding new taxes or ballooning the deficit. Revenue is coming in much stronger than expected, amid a red-hot labor market. Morneau has downplayed the significance of the numbers, but it nonetheless gives him some breathing room. Despite that windfall, there’s more red ink than Trudeau pledged to voters the first time around. The prime minister won power in 2015 on a platform that forecast a return to balance by now. The opposition Conservative Party regularly attacks him over the scale of his deficits, though they remain modest by global standards at 0.8 percent of gross domestic product. 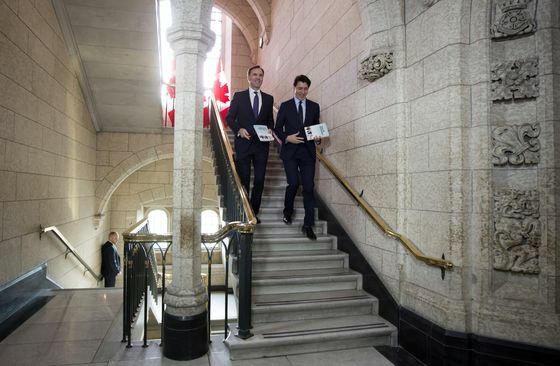 “We expect the government will spend part of this windfall while protecting the bottom line,” Scotiabank economists Jean-Francois Perrault and Rebekah Young wrote in a note to clients. They projected the deficit for the fiscal year that ends this month could plunge by C$10 billion, to C$7.7 billion, and fall to C$12.2 billion in the next fiscal year, before major new spending kicks in.